This one’s up on Kickstarter for only a week longer! Anyone planning to design a microgame has a number of tough decisions ahead of them due to the inherent limitations of the style. How do you make a game that feels complete when only 18 cards are available to you? How do you fit in the necessary information without cluttering the cards? How do you give the game a decent theme, nevermind incorporating the theme into the way the game plays? 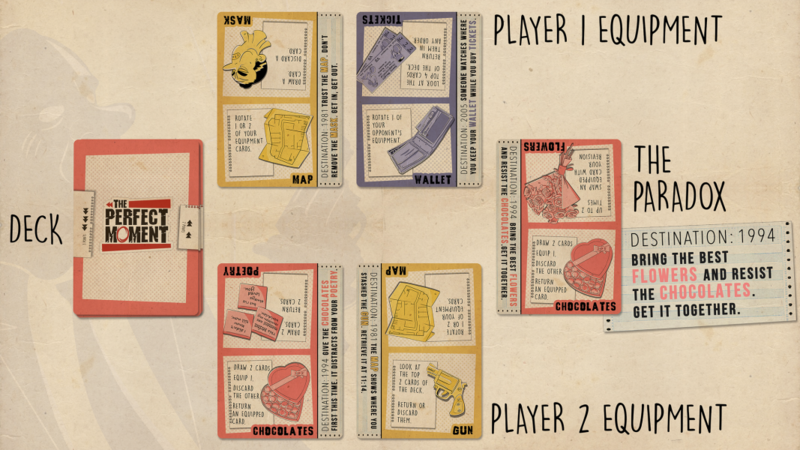 There are a lot of challenges to designing a microgame, for sure, and I’ve thought about them a good amount, but there are also some advantages. Key among them is the fact that the contents of an 18 card deck are much easier to remember than most decks in most games. This means that microgames can more readily present what would otherwise be advanced strategies in larger games (card counting, manipulating the deck, and generally knowing precisely where cards are). Microgames don’t have to utilize this, and doing so doesn’t mean they’ll be good. Love Letter counts on players knowing exactly which cards remain and it’s merely okay. Sprawlopolis is my favorite microgame of all time and only the most advanced players would memorize the deck. 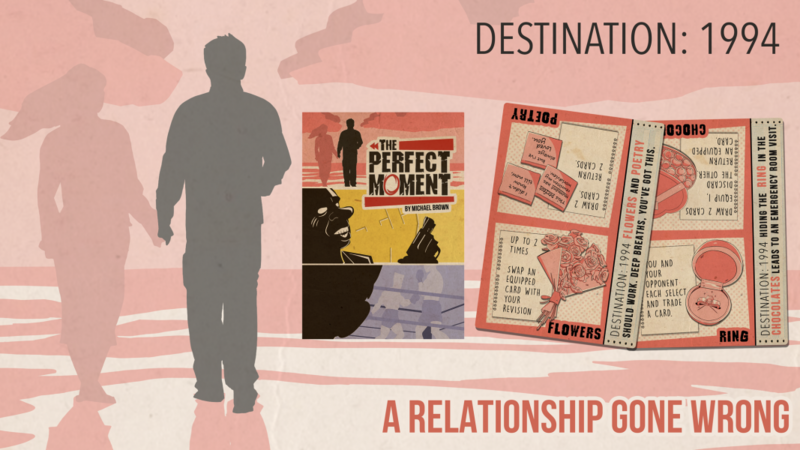 The newest game from Sprawlopolis publisher Button Shy–The Perfect Moment–is entirely centered around manipulating and uncovering the hidden mysteries of a small deck of cards. Thematically, The Perfect Moment has you travelling back in time to fix three significant events in your life. You’re not the most upstanding citizen, as one of the events is a burglary and the other involves sports betting. But at least you have love! Or you will, if you utilize time travel effectively. I guess that works out? Time travel always interacts with notions of free will in interesting ways. A core question of free will is this: if you can imagine two parallel universes that are identical in every way. In those two universes, is it possible that a given person’s decision (any decision) could be different from each other? Or do identical inputs always result in identical outputs? If x inevitably leads to y, then time travel, in which you can go back and change x, is, at the very least, an additional layer of perceived freedom. One of my favorite comics aptly pointed out that Candyland is a nice metaphor. No matter what happens, the deck of cards is in place and you can’t change what your cards will be. Dice are an interesting wrinkle, because in a completely Newtonian universe they would have the same properties as a deck of cards–the result will be, from a time-adjacent perspective, always the same. Of course, from what little I understand, outside notions of divine interference, we almost certainly don’t live in a world of physical determinism. All of that to say that The Perfect Moment is actually wonderfully thematic in that clever, rich way where the metaphor doesn’t just exist, it functions. From the moment you begin you’re told by the game that you’re going to want to pay attention. Setup involves a draft of sorts, where you seed your own equipment, as well as your opponent’s. This equipment give you actions that you’ll perform on your turn. Maybe one will let you draw a card, and then discard another, either from your two pieces of equipment or from the single card you’ll have in hand. Another has you discard two cards before drawing back up to two. Maybe you’ll start a trade between you and your opponent, or allow them to score a card for one point in order to activate one of their pieces of equipment twice. Or maybe you’ll simply need to rotate an equipment card. See, all of the cards have two abilities on them, and you have access only to the abilities facing your direction–on both your and your opponent’s cards. Card orientation doesn’t just matter for action access, it also determines how many points you score when you score a card. Ideally you will be able to match two items in your equipment facing the same direction to your card in hand or the neutral card on the table–that’s a three point play. If you can match the items, but they’re facing opposite directions, it’s only two. Match just one item? It scores one point, but also scores faceup where anyone can score it again. A one point play can clinch your victory, or put pressure on your opponent, but it also opens up their scoring window. 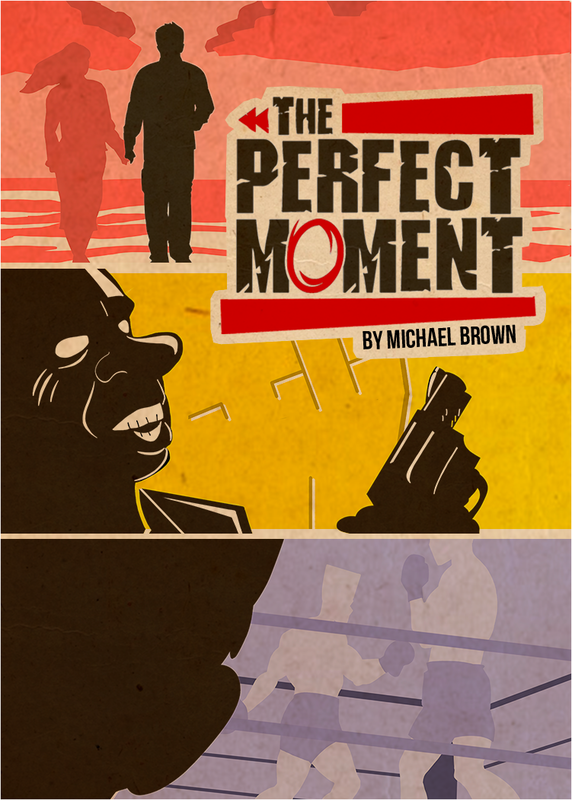 At its best, The Perfect Moment is a tense two player puzzle where the currency is information as much as anything else. Nearly every possible action will not only provide you more information or set up something in the future, but it will affect what your opponent can do. Each turn is an interesting possibility space with the question: can I score 3 points here? Barring that, can I throw a wrench in my opponent’s plan? Unfortunately, A Perfect Moment doesn’t quite hit that “best case” situation all of the time. When two players are manipulating the same deck of cards, there’s certainly a lot of interaction, but that also means that new information is quickly made irrelevant. Seeding something on top of the deck is typically only valuable if you can utilize it that same turn. Otherwise your opponent is going to muck it all up and you’ll have to start more or less from scratch. The puzzle is strong, but it’s necessarily shortsighted. As a result, I don’t see a lot of catch-up potential once someone takes a decent lead, and taking that lead feels frequently determined by the luck of the draw. Scoring does slow down your tempo, as you will then probably want to pivot to a different color or re-manipulate a variation of the color you just scored in order to set up the next scoring play, but that’s true whether or not you’re in the lead. This is a first impression, though, and I could be mistaken about the high-level play. Perhaps there is room for two people to turn The Perfect Moment into a chess-like “thinking one step ahead” joust. Maybe there’s efficiency to be had in manipulating your opponent’s options above trying to set up your own score. Or maybe the solo game is where the long term strategery resides (I decided to only look at the 2p game). If my impressions are correct, The Perfect Moment isn’t a bad game–certainly not! It’s attractive and better than most microgames I’ve played. But it doesn’t give me the excitement that Sprawlopolis did. That game accomplished something amazing–it made a meal out of what should have been a snack. The Perfect Moment is still a snack, though tastier than most.